Hands down THE best Vegan Banana Pancakes. They are soft, fluffy, super delicious and so simple to make, from scratch, in a blender. This is an essential, keep handy in your back pocket, recipe that everyone needs for an easy, yet decadent breakfast! Add all of the ingredients to a blender . It blends up much easier if you add the liquid ingredients first, followed by the dry ingredients. If you don't have a blender you can make them by hand. I will include instructions at the end. Blend the ingredients until smooth. Don't over blend. turn it off as soon as everything is smooth and combined. It should take less than a minute. Leave the batter to rest for at least 10 minutes. It will be thick. Don't be tempted to thin it. While it rests, preheat your griddle to medium (about 325 °f) or use a skillet or frying pan . Lightly grease the pan/griddle with a brush, then pour the batter on in rounds, about 1 ladle full per pancake or roughly ⅓ of a cup. Leave to cook until bubbles appear all over the top and begin to pop, then flip very gently. Allow to cook for another 2 to 3 minutes until golden then remove from the pan and serve immediately. Mash the banana really, really well until it is a puree consistency. Beat it together with the milk and oil until combined well. Add all of the dry ingredients to a bowl, whisk them together, then gradually pour in the milk, stirring as you go to work out the lumps. Stir until all of the flour is absorbed and the batter is smooth, then leave to rest for 10 minutes before carrying on as above. For optimal visual appeal, I have found that vegan butter works much better than oil when cooking pancakes. You can see the difference between the 2 in my video and photos. The video pancakes were cooked using oil, the ones in the photos were cooked using vegan butter. As always with any recipes involving flour, I highly recommend that you weigh it. Cup measurements are not accurate enough to get the best results. If you do need to use cups, spoon the flour into the cup then level off the top with a knife without compacting it or shaking it down. By doing it like this you will get roughly the correct amount.If you scoop the flour up into the cup, you will end up with much more than is needed and it will affect the outcome of the recipe. Digital scales are available at most big superstores now and you can pick one up for around $10. It's so worth it! 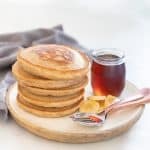 These pancakes need the little bit of oil in them to have the perfect texture. If you omit it they won't be nearly as light and fluffy. Adding the nut butter as per my substitution suggestion, provides a little bit of fat and helps somewhat for an oil free version, but for the very best results the oil is necessary.